What differentiates Bellini from his contemporaries, even his brother-in-law Mantegna, is a highly personal language and sensuous style. Drawing on both Byzantine and Flemish traditions, his work constantly evolves from paintings where landscape plays a major role to those with dark backgrounds where the play of light and shadow dominate. 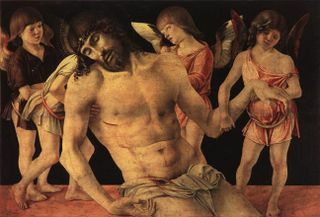 In Christ Crucified with Jewish Cemetery, Bellini depicts more than thirty botanical species, each perfectly rendered and said to be botanically accurate. In other works, all landscape and decoration are avoided, with the viewer's attention drawn only to the central figure or figures. Bellini's colors are deep, rich, and luxurious, something the designers of this show captured in gallery walls echoing the Virgin's glorious magenta or lapis lazuli blue robes. It's not just the sumptuous colors or the softness of the light that surrounds Bellini's Madonnas, saints, and Christ figures. What totally astounds the viewer is that each painting is a meditation. The painter's intent is clear. Bellini wants you, the viewer, to respond with emotion and sympathy to his deeply moving images. As art expert Rona Goffen commented, Bellini treats the viewers as worshippers who need to be totally sensitized to the extent of human suffering. In Dead Christ with Four Angels (above), Christ's face is lit by the glow of an angel's clothing. Everything in the painting directs you to the lifeless body. The experience of viewing a Bellini religious painting is similar to studying a Buddhist mandala except instead of the cosmos being the heart of the work, here it's most often either the Madonna or the Christ figure. In the last gallery, is the most revolutionary painting in the entire show. The Drunkenness of Noah (above) depicts a story from Genesis where Noah, having overdosed on wine, lies naked and unconscious in a vineyard, his head resting on a stone. His mantle has fallen to one side. And he appears fragile and elderly compared to his robust sons. Two sons, Shem and Japheth, avert their eyes, while Ham, with a twisted smile, seems to mock his father. He is the only ugly character in all of the works on view. His face is distorted and threatening. The effect is puzzling and disturbing. Some experts claim that the Noah figure anticipates the nakedness of the Christ on the Cross and the wine prefigures the Eucharist. Bellini was near the end of his life when he painted the Noah and his sons scene and perhaps in some way he identified with the aging father. After all those exquisite Madonnas the painting is arresting. But it is an example of the painter's genius and contribution to those who followed after him, especially the powerful realism of Caravaggio.